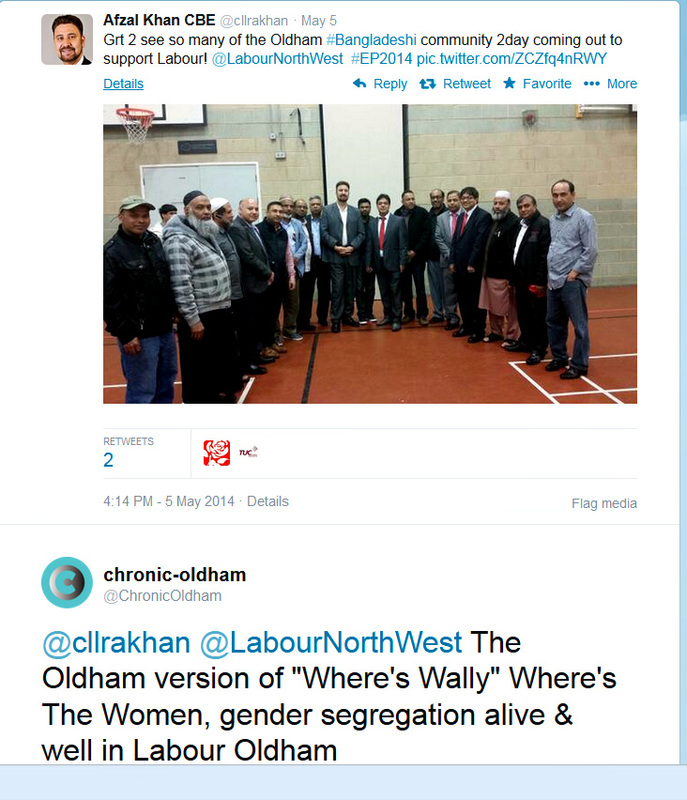 In 2014 we challenged the Labour Party on the lack of women involved in their electioneering within Oldham’s Bangladeshi community. Click here see the challenge from 2014. On the 15/11/2015 the Labour Party stated at one of their rallies that they “need to get every vote to wipe UKIP out” which is a strange statement to make to a room full of men rendered conspicuous by the lack of women present. When a political party sets itself up as the answer to discriminative UKIP and Conservative policy yet accepts misogynistic gender segregation by hiding it behind the unmentionable wall that is accepted ‘cultural practices’ it demonstrates their complete lack of character and undermines all issues of equality. We perused many photographs from the event attended predominantly by people who appear to be Asian men. We could not find any Asian women who were not politicians or politicians members of staff, just five white females could be identified in the audience two of which were local politicians but it could not be ascertained if the others had any politcal connections as they sat further back in the pictures.